I have to say, I think Jeremy Parish is one of the leading game music bloggers. Every single time I have a question, I run a Google search to get started, and two hours later, I somehow end up on his blog on 1UP.com. 1UP: Gradius II for Famicom was one of those games that never came to the U.S. because it had a special chip that improved the graphics and sound. Did you find it easier to work with those chips, like the VRC6? HM: (in English) I made! 1UP: You made the VRC6? HM: (begins drawing diagrams) These are the waves for the sound. With Famicom, there were three types of waves — square, triangle, and sawtooth — and you were able to use one for each of the three channels. But with the VRC6, you could add an additional three channels for a total of six notes, six channels. I was actually the one who developed the chip. Of course, there were other technical people who put the parts together, but I was involved in its design. A chip is small, but the prototype is huge! I think the chip was first used in Akumajou Densetsu, which was Castlevania III in America. 1UP: Yeah, when it came to the U.S, Castlevania III didn’t have the same chip, so it didn’t have all the sound channels. Did you have to do the conversion on the music yourself? 1UP: That’s the interesting thing. Maybe it was the challenge, or maybe just the sound of the hardware, but something about those games really worked. Did you feel at the time that the games you were creating were something special? HM: Here’s how I explained it to people back in the day. Say you have Tokyo Tower; when you say to people you’re going to create Tokyo Tower, you’d first think about what sort of materials you’d have to gather to build it. That’s something you can do with current technology. But back then, we were working on low-spec hardware, so we couldn’t properly express Tokyo Tower. What we did instead was — there’s a sort of art craft here in Japan that’s made of bamboo. You use the bamboo and you can make really detailed models, and they have their own distinctive flavor. So that’s how I always described my work: a tiny, detailed bamboo art craft version of Tokyo Tower. It had its own distinct flavor, and it was tangible — you could reach out and touch it more easily than the real Tokyo Tower, and it was the work of just one person. So in a way it’s more real than something you see on TV or on a movie screen. That’s probably why the work had its own unique warmth. This answers so many questions. Wow. It means that Maezawa DID NOT convert his own tracks from Akumajou Densetsu to MMC5. Maezawa is the creator of the VRC6. Here’s a documented example of a composer talking about “scaling down” his work for a “low-tech machine”. His “Tokyo Tower” metaphor gives great insight into the mind of a composer working with limited resources, attempting to make something memorable. Of course, more to come. Hope this was informative. So, as I mentioned in my post yesterday the Nintendo Entertainment System was shipped to the United States without the two pin connector that controlled the sound expansion chips. Why? It basically looks like an old 3.5″ floppy drive from back in the day. This old fossil actually ran on 6 C-cell batteries. Yes, batteries. The point is, since all of the games made for this Disk System were NOT cartridges, there was no way to add any extra sound or graphic booster expansion chips. A disk, being a disk, doesn’t allow for that. So, Nintendo provided a RAM adapter. 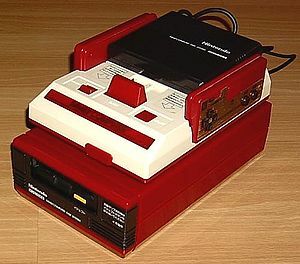 It was literally just a big cartridge you plug into the top of the Famicom (black box on top of Famicom in picture) that contained a new microprocessor that facilities the use of the Famicom Disk System (a disk controller, 32 kilobytes of RAM, etc). It also contained a customizable audio expansion known as Nintendo FDS. You could literally adjust and manipulate the Nintendo FDS to make anything from a sawtooth wave to a square wave. Very powerful. 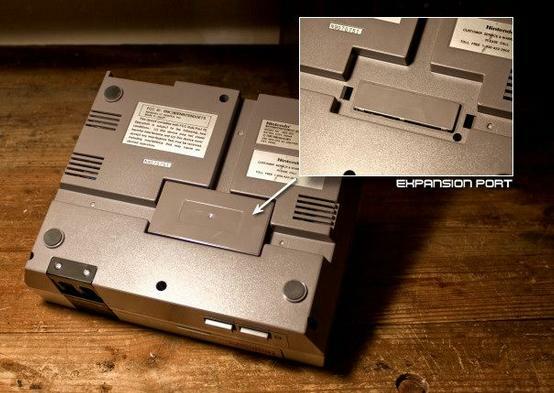 So, long story short, when the NES was released in the US, Nintendo decided to put the sound expansion port on the BOTTOM of the console so that, when they released the Disk System in the US, a RAM cartridge would NOT have to be added. So remember, as a kid, you wondered what this strange box was on the bottom of your NES? Well, now you know. Sorta. There’s a lot of speculation as to what Nintendo REALLY wanted for this port- a modem? Extra controllers? I was unable to find any reliable information but was able to confirm that indeed, the sound controller pins were moved to this port. Nintendo eventually found other ways to integrate sound expansion modules without the use of the pins. That is why in the Castlevania III example from my previous post, the composers were capable of using MMC5, a first party Nintendo sound expansion chip since it was integrated differently (In the case of Castlevania III, the entire chip was used for the game and no extra audio channels were activated). However, we lost a LOT of the third party sound expansion chips, many of which were very powerful. Here’s some examples of third party chips we didn’t hear. UPDATE: The “NAMCO 106” actually does not exist. It is actually called the NAMCO 163. The 163 adds an astonishing 8 extra channels of sound. As you can see, the Nintendo, when using the sound expansion chips, has a vast range of sounds and instrument voices. A lot of Japanese composers wrote for specific chips (especially the composers from Konami) and therefore, in the US versions, entire voices in songs were lost or changed. Many VRC6 tracks had to be rewritten to Nintendo 2a03, losing at least a three voices each time. I hope this was informative. Any comments are welcome.